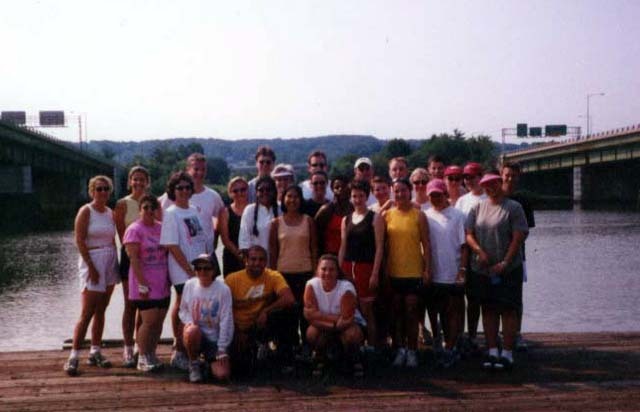 Capital Rowing Club has been a presence on the Anacostia River since 1995, when it became a founding member of the Anacostia Community Boathouse, at the time located at 1115 M Street SE. The Anacostia Riverfront looked a lot different then: Capital didn’t have a lot of neighbors on either side of the river, let alone much boat traffic on the water. Today, the skyline along all of M Street—from the railroad bridge all the way down to Hains Point—is considerably different, boasting new businesses, new places to live and work, and new access points to explore the river. Capital has changed, too. In 1988, Capital began with six adult members. Thirty years later, it comprises 11 rowing teams, providing comprehensive programming to over 400 rowers of all ages and abilities. Capital Juniors is one of these 11 teams. Started 10 years ago by two masters rowers, Capital Juniors seeks to make rowing more accessible to students in the DC area. 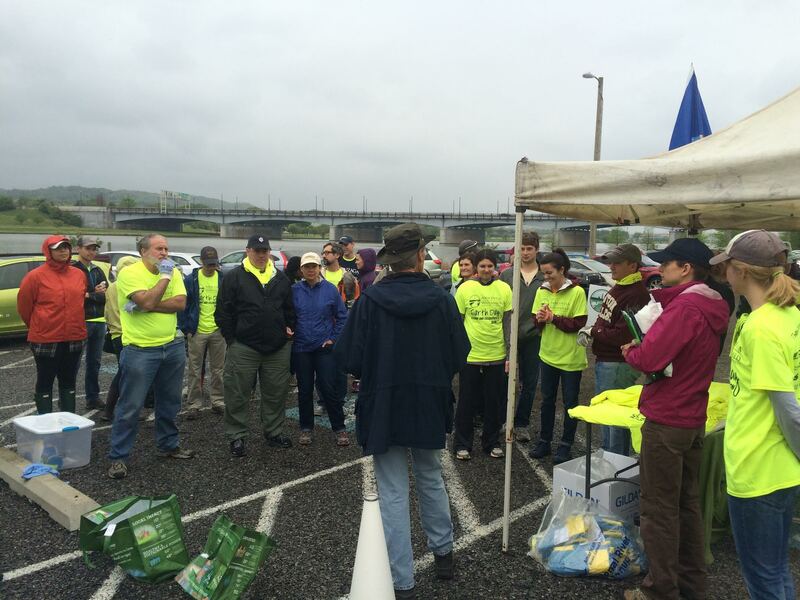 The team brings more than 60 middle and high school rowers to the Anacostia River each season. They learn not only how to row but also now to protect the river. 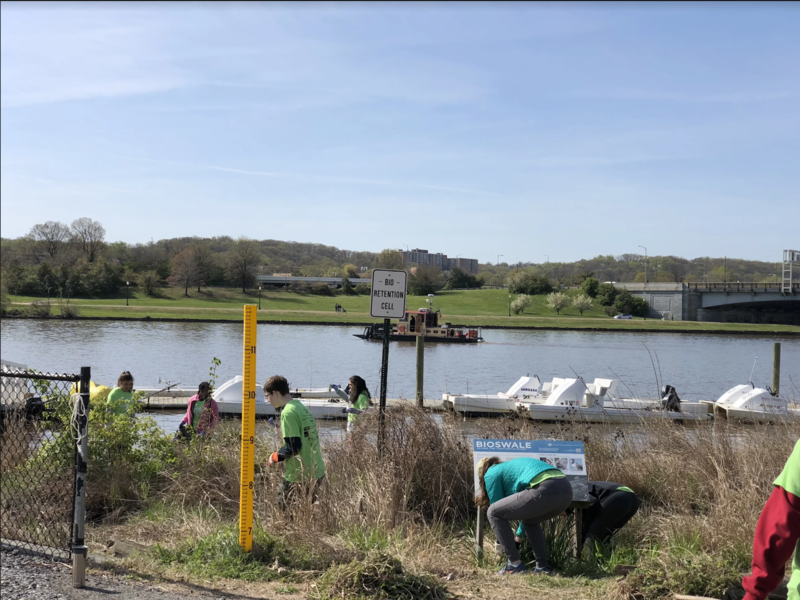 On Saturday, April 21, 2018, in celebration of the DC’s Year of the Anacostia and in honor of Earth Day, Capital Juniors partnered with the Anacostia Watershed Society to bring even more visibility to the Anacostia River. We invited neighboring teams to a day of community service and friendly competition. Nearly 200 rowers from Capital Juniors, Georgetown Day School, Elizabeth Seton High School, Bishop Ireton High School, Sidwell Friends School, and Holton-Arms School participated in the service-learning project, where they were responsible for cleanup activities around the bioswale surrounding the boathouse. 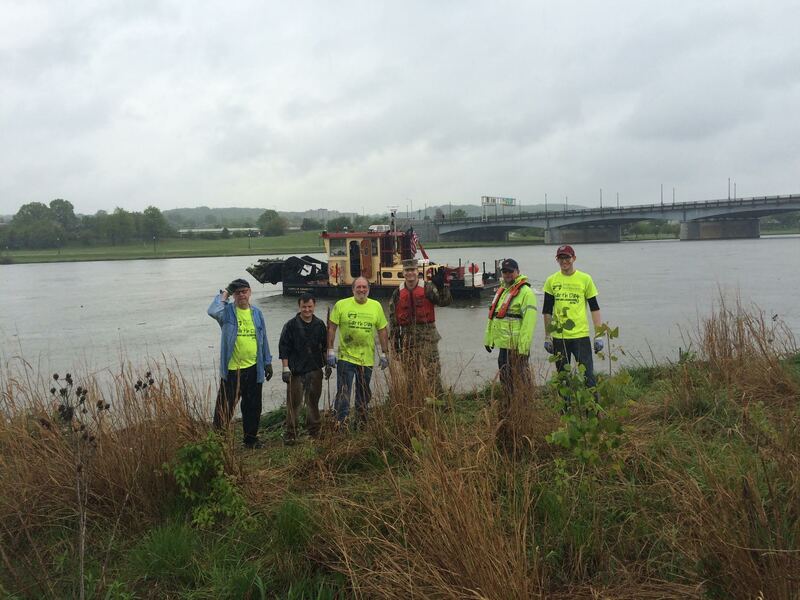 The teams collected dozens of bags of trash that would otherwise end up in the water or in the river habitat. Following the riverfront cleanup, the rowers convened for the first annual Anacostia Sprints, Capital’s first juniors-only regatta. With over 50 entries, the regatta provided the athletes an opportunity to row on the Anacostia River, some for the first time. 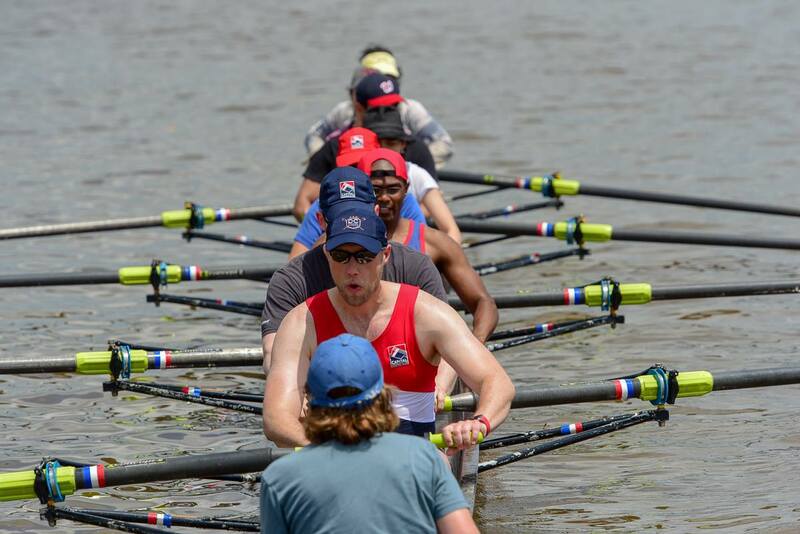 About half of the competitors practice and race on the Potomac River, so the Anacostia Sprints was a special way to introduce them to DC’s so-called Other River. It was also special that all the participating teams took home some race hardware—button pins that featured some local DC history. 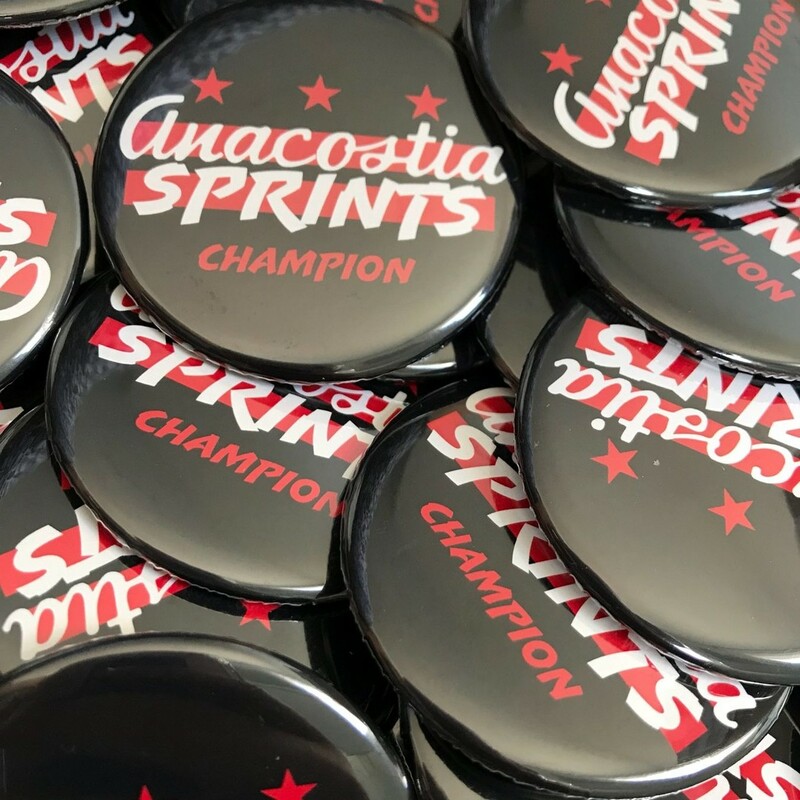 The pins were adorned with the Anacostia Sprints logo: a rendition of the DC flag with an overlay of text based on a popular 1940s-era neon sign found in the Anacostia neighborhood. After all, Capital is committed to its mission of supporting and celebrating the community around the boathouse. Looking forward, Capital Juniors is excited to invite even more rowers to the Anacostia River, in what we hope will become an annual tradition of community building and racing. That grassy strip that you park next to and that you carry your boats across is a small area that does big work. The bioswale—the buffer between the boathouse and the river—is a first line of defense, soaking up stormwater runoff and filtering pollution before it enters the Anacostia. This Earth Day, 260 volunteers from across the Anacostia Community Boathouse Association (ACBA) and Anacostia Watershed Society (AWS) participated in cleanup efforts along the bioswale, collecting trash, removing invasive plants, and planting native, flood-resistant species like shadbush, red-twig dogwood, and blue flag iris. In particular, as part of a nationwide effort and the theme of this year’s Earth Day—“No Plastic Straw Please”—volunteers picked up and counted plastic straws, one of the major contributors to ocean plastic. More than 320 plastics straws were collected from 33 sites during Saturday’s AWS-led cleanup. Destined to accumulate in the oceans, most of these straws were brought in by the river over the winter. 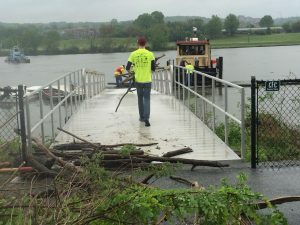 This year also marks the “Year of the Anacostia,” celebrating the cleaner, healthier river that the Anacostia is becoming. Earth Day wasn’t the end of Capital rowers’ stewardship of the river. Bioswale work sessions, led by the indefatigable Mary Ellsworth and Jim Smailes, take place on the last Sunday of each month from 9:30 am to noon. So if you missed Earth Day—or want to continue contributing to the health of our river—sign up for a work session! 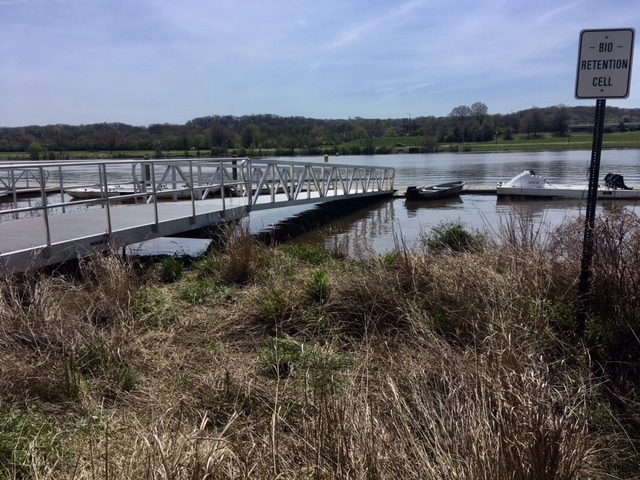 Learn more about our river—and how you can help protect it—at the Anacostia Watershed Society, the Year of the Anacostia, and the ACBA Bioswale websites. If the bioswale looks tidier, that’s thanks to the many volunteers who lent their time cleaning and clearing on Earth Day. I would like to thank all of you for a wonderful year. Thank you for your enthusiasm, volunteerism, and generosity towards our club. Without your support, we would not have been able to carry out our mission and to achieve the successes of this year. I ask you to continue that support in the off-season. While the boats may be securely stowed away, our club activities have not ceased. This year, the Gala will serve as both a fundraiser and a celebration of our accomplishments. I hope to see you all at this end of the year event. I am also looking forward to each programs’ end of the year gatherings. Finally, I am looking forward to the ACBA’S boathouse lighting and community award ceremony, when (perhaps) one or more of Capital members will be honored for their contribution to ACBA and the community at large. It has been an honor to serve as your president this year. Congratulations to all of our newly elected Board members. I am excited to work with the new Board to continue the great tradition of Capital and to bring new exciting, beneficial changes to our great club. We have a day for giving thanks. We have two for getting deals. Now, we have #GivingTuesday, a global day dedicated to giving back. On Tuesday, December 1, 2015, give to Capital Rowing Club and show your dedication to and passion for community rowing. We all benefit from the investments CRC has made to build our community and our sport, and you can ensure that that tradition continues. Give your year-end gift on Giving Tuesday, and encourage your teammates, friends, and family members to do the same. Learn more here. Which program do you row with at Capital? I row for the Juniors program and am the co-captain for the women’s team. When did you first start rowing? What do you like about it? I have been rowing for almost three years. I started rowing because I was going to be out-of-town for volleyball tryouts and a lot of my friends rowed, so I thought it would be a fun and an interesting sport to try. I stuck with it because, to me, rowing is the ultimate team sport and pushes people past their limits. Of course, I am not a fan of erging most of the time, but there is something quite peaceful about rowing on the water. I love the adrenaline and being able to see yourself in relation to the other boats, which makes me push even harder. I played volleyball and have probably played almost every sport you can think of. I really like to go to spin classes, do yoga, and, after last year’s winter training, I like Crossfit as well. I’m a senior at School Without Walls High School. What do you hope to do after high school? My plan is to attend college, hopefully the University of Wisconsin-Madison, and major in sports medicine while rowing. After college, I think it would be cool to be an athletic trainer for a professional sports team and still row. Favorite place in the DC area? My favorite place in DC is Capitol Hill, probably because I am always there since most of my friends live and there is a lot of good food. Share a favorite Capital moment. I have a lot of good memories from my years of rowing with Capital, but I think some of my favorite moments came from Mid-Atlantic Erg Sprints this spring and making our team video. We’ve made two team videos and it is such a fun experience dancing while cheering on our teammates racing, and we’ve done pretty well the past few years. 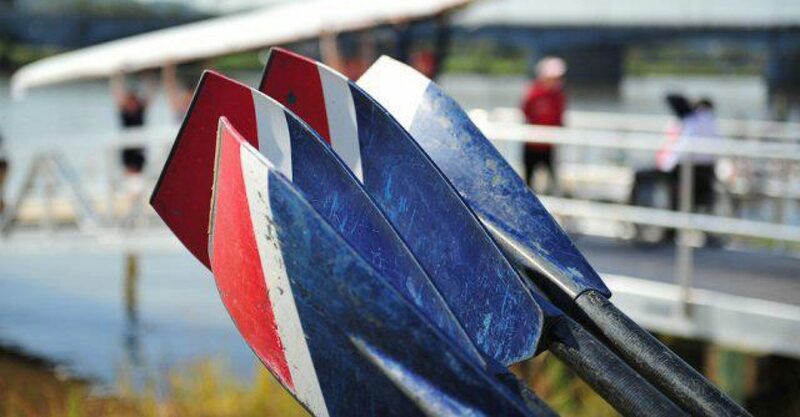 What are you looking forward to this year as a Capital rower? I am looking forward to the spring because it is my last season with Capital and we are trying to go to Youth Nationals, so we are very excited. Although our teams are off the water, winter workouts and conditioning are just around the corner and athletes should dress properly for the occasion and the climate. 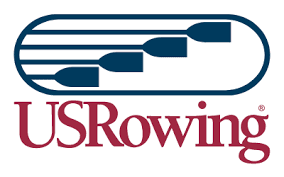 USRowing shares tips on what to wear here. Teams will also be using the ergs heavily over the next few months, so please remember to treat them with care! Avoid exposing them to the outside elements. If you must move an erg, have two people carry it to avoid extra stress on the machine. Place the handle all the way up next to the fly wheel when you aren’t using it to reduce strain on the chain. And always wipe handles and seats down when you’re finished. Report any problems with ergs to your coach immediately, so the problem can be addressed. Thanks to all our 2015 newsletter contributors, interviewers, and interviewees!